For decades, the ruling party has governed by pitting the Oromo and Amhara against one another. Now the two groups are joining forces against the government. "There are decades where nothing happens; and there are weeks where decades happen," said Lenin, describing the Bolshevik revolution. For Ethiopia, the start of August 2016 saw such a week - one that will go down in Ethiopian history as a moment in which a grassroots movement achieved in days what organised elites have not been able to achieve in two decades. In that week, hundreds of thousands of people took to the streets in unprecedented numbers to protest against decades of abuse, discrimination, and marginalisation. This was the culmination of a wave of protests that began nearly ten months ago and has since continued in Amhara and Oromia, two of the country's most populous regions. The government responded by dismissing the protesters as agents of foreign forces directed from Eritrea and Egypt, and it deployed armed forced into civilian centres, leading to the deaths of over 600 people, according to estimates, and the arrests of many more. Despite this disproportionate and excessive force, however, protests and strikes have endured, with a movement of movements mobilising a new generation, tapping into a groundswell of shared discontent. 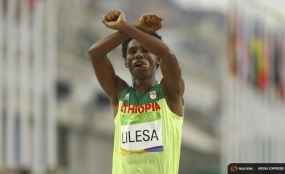 At the heart of this activism is a burgeoning solidarity between the Oromo and Amhara ethnic groups, who make up around two-thirds of the country's population combined and have begun to come together despite longstanding historical differences. Ethiopia is an assemblage of diverse ethnic and cultural groups. But historically, up to around the 1970s, 'Greater Ethiopia' pursued a policy of ethnic homogenisation in which Amhara identity became the identity par excellence, pushing others to the periphery. In particular, the Oromos, the country's largest ethno-national group, were not treated as equal partners and did not have influence commensurate with their demographic, geographic, and economic contribution. These asymmetries helped fuel the historic antagonism between the two groups. Since coming to power in 1991, the current government - led by the Tigrayan People's Liberation Front (TPLF) - has instrumentalised this rivalry as a political weapon. It has created a governing narrative in which Amharas and Oromos are eternal adversaries, representing an existential threat to the future of the Ethiopian state and stability of the region. Oromos are framed as secessionists who represent a clear and present danger to the unity and sovereignty of Ethiopia, while the Amharas are presented as chauvinist and violent, working towards the resurrection and re-imposition of the old Medieval-type empire. Within this narrative frame, the ruling party, dominated by ethnic Tigrayan elites, becomes a beacon of stability and unity in diversity. "The blood flowing in Oromia is our blood too"
For 25 years, the ruling party has relied on these myths to sow the seeds of division. But this is now beginning to unravel. The violent response of the ruling party to both the Amhara and Oromo protests has brought into sharp focus the shared vulnerability of the oppressed in Ethiopia. The mutual experience of loss and suffering has generated intense collective emotions, exposing the porous nature of the faultlines that both divide and unite the two communities. As the violence of the state has intensified, former arch-foes have set aside their mutual rivalry to congregate and endure with one another. An extraordinary groundswell of solidarity is emerging at all levels, exposing the shaky foundation of the regime. "We are all Oromos", "I am not Oromo but I stand with my Oromo brothers", "Amhara is ours, Oromo is ours", "The blood flowing in Oromia is our blood too" are just some of the many expressions of solidarity declared at rallies. At the same time, Oromo and Amhara protestors have also begun to hold solidarity rallies together, flying their respective flags - both symbols of resistance - alongside one another. No collective action is more destabilising to the narrative of the state than the joint appearance of these two symbols, which entered the country's political imagination as antithetical and irreconcilable. A regime that seemed invincible has begun to tremble at this sight, with officials expressing their disgust and fury at these two symbols of resistance being presented together. For instance, Government Communications Minister Getachew Reda expressed his outrage at the alliance between Oromos and Amharas and his government's determination to destroy it, describing it as "unholy" and a "gamble". While mainstream Amhara politicians insist on national unity as a condition for collaboration, Oromo nationalists reject these demands on the basis that there is not yet a shared set of democratic values, principles and ideals that could 'unite' the two groups. They insist that any values that are shared between the groups did not emerge out of a relationship of equality and therefore should not be the starting point for a new vision. Contrary to some fears, there is great strength in these weak ties, and this emerging solidarity - incipient and precarious as it is - represents the greatest threat to the regime's long-standing policy of divide and rule.